No, really, Gabriel has completely turned round this season. He’s like awesome mentor to everyone giving great advice and insight. I don’t know when his happened but kudos for making me not want to kill this character. Rosita didn’t listen to Gabriel any more than she listened to Eugene – and she tries to shoot Negan after he kills Spencer… and worst possible luck she hits Lucille instead. 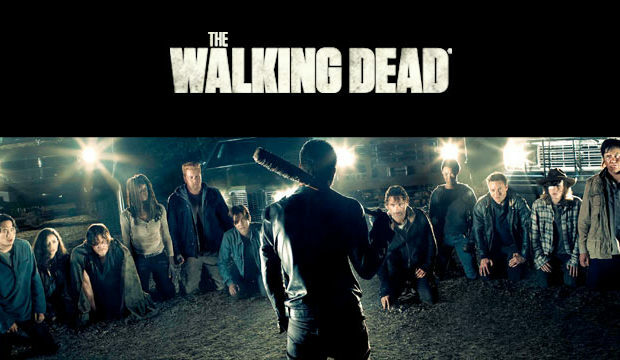 In the aftermath Negan decides to do exactly what Eugene warned her he would do – he has someone at random killed. Olivia. Damn it, Olivia was starting to become more prominent and she slapped him and I really really really would have loved to see more of her. She could have been interesting. The moment when she insisted to Tara she would stay because she promised Rick she would look after Judith was such a nice character moment. Olivia is afraid, she’s been repeatedly insulted and offended for her weight but she said she would do this thing and she’s going to do it. Negan demands to know who made the bullet since he can tell it was home made and ability to make bullets is a super useful skill… after a moment of “I’m Sparticus”-ing, Eugene tearfuly tells Negan it was him. Which is when Rick returns – to have Negan being terrible, Spencer needing putting down and to be told that Eugene is going with them. And he expects Rick to be grateful. It’s an enraging, breaking moment and you can see the future from here – with 2 dead, one taken and one brutally beaten on Negan’s very first visit. But we have one more storyline – Michonne. She kidnapped one of the Saviours last episode and demanded she be shown the Saviour’s compound where Negan is. She is told “we’re all Negan” and sees just how huge the Saviours are. There’s an odd moment where the woman she has kidnapped urges Michonne to ditch the car, pretend this never happened – and kill her. I’m not sure why this Saviour wanted to die… did she think Michonne would have a chance to bring Negan down? Is she afraid of consequences? Is she just done? I don’t know – but Michonne does just that and returns to Rick to give him an awesome speech. She has been looking for a way forward, a way she wants to go on – but she wants them both to go on. She wants their way. She wants Rick and her to come together. She has an epic speech about what they do – they survive. They survive and fight and get things done. It’s what they do, it’s what they’ve always done and it’s what they have to do for the future especially for the kids Michonne isn’t content with just surviving and hoping – she’s ready to fight and find a way because they always have. And I love this from Michonne because it’s a lesson of action and hope, because she’s leading the way but not following Rick’s lead. Because we see it as part of her story progression: from being silent, to demanding Rick support her in finding a home which she saw in Alexandria, to having and adoring that home and then, now going on to demanding they make that home safe and real again. This has been Michonne’s progression: being alone and hurt and lost to seeing what she wanted, demanding they pursue that, being more than a weapon, demanding that home be preserved and protected and continue.